Surf and turf art in Logan Co. 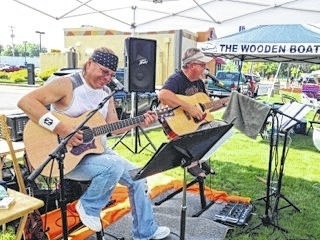 Rob Neeley, left, and Charlie Knott provide two-part entertainment to the crowds at Russells Point Harbor for the Wooden Keels and Vintage Wheels on July 18. This was the third year that Knott has played for the show and he said that he always enjoys the gig. “This is a cool place just to come and hang out for a while,” he said. 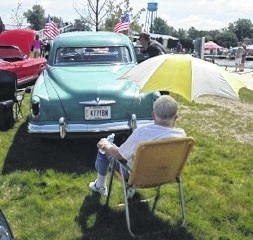 This ’52 Studebaker was among vintage vehicles during the weekend event. The 17th annual Wooden Keels and Vintage Wheels in Russells Point Harbor, as seen from atop the Sandy Beach Bridge July 18, had 90-degree temperatures, but that didn’t stop hundreds of visitors from viewing the beautifully-restored boats and cars. Diamond Girl is a marvelously crafted Marinacci Torpedo, the model name derived from the unusually-shaped stern. Owner Cliff of Zanesville said he named the boat Diamond Girl as a new rock was the exact price extracted from him by his wife once she learned he had bought the Torpedo to restore. RUSSELLS POINT – If I learned anything from the 17th Wooden Keels and Vintage Wheels at Russells Point Harbor July 18, it’s that gearheads and boaters have at least one thing in common: Selective memory. These are people who are always losing their glasses and couldn’t tell you what they had for supper last night, but can remember every knuckle they busted over the years cranking a wrench on some beater with four wheels or a tub with a hole the size of a basketball in the keel. Cliff from Zanesville is a perfect example. He owns and restored an exquisite teardrop-shaped Marinacci Torpedo. When asked if he had always been into boats, he hemmed and hawed for a minute before proceeding to list every boat he’s owned and restored over the past 30 years. I wanted to talk about the stunning piece of art that he had docked on the east side of Russells Point harbor, and he’s telling me about a Chris Craft he owned in 1997. Having been to dozens of car shows over the years, I regret having missed the first 16 installments of the Wooden Keels and Vintage Wheels. It was nearly impossible not to stop and gawk at the meticulously restored watercraft. A majority of the boats on display were indeed wooden (there were also a bunch of neat-o fiberglass boats), with that wood mostly being mahogany, which today is rare as chickens in need of orthodontia. I asked several different people why mahogany was so popular for boats, especially in the pre-WWII era, and was given several different theories in reply, citing the wood’s density and grain and ability to bond. The simple truth is that mahogany is gorgeous and nothing looks better when skimming across the water. The Wooden Keels and Vintage Wheels is a show, not a competition. No awards are given. There is no panel of judges scribbling notes and eyeballing the cars and boats for minor imperfections. Jim Foeller, who helped organized the event (and who also had a boat of his own in the show), likes the fact that participants aren’t there vying for a best in show ribbon. Organizers had most of the boats in the east and south sides of the harbor and set up the vintage cars to the west, giving those atop the Sandy Beach Bridge a wonderful panorama of (mostly) American function and form dating back the last 100-odd years. On Main Street, which was blocked off for the four-hour show, one could even see combinations of the two halves, as was sighted a satin-black ’40 Ford short-bed pickup towing a ’55 Larson motorboat, both of which were beautifully restored. Also parked on Main St. was the Beemer, a 27-foot Meteor Runabout that was manufactured in Piqua in 1929. Owner Bob Whited lives about a stone’s throw from Russells Point Harbor, but was kind enough to bring the Beemer along on its custom made trailer as to allow more up close and personal inspection of the mahogany-and-chrome masterpiece, named after his granddaughter whose initials are B.M.W. Whited said there were only about 60 Meteors manufactured and that he knows of only seven that still exist. While he didn’t say so, it’s a safe bet that the other six do not look like this one. This is a showroom model that is 86 years old. MSRP on the Meteor in 1929 was $1,850, out the door, but Whited just smiled and shook his head when offered a flat $2K for the kit-and-caboodle, a full $150 above sticker price. Gearheads and boaters are peas-in-a-pod. https://www.urbanacitizen.com/wp-content/uploads/sites/36/2015/07/web1_band.jpegRob Neeley, left, and Charlie Knott provide two-part entertainment to the crowds at Russells Point Harbor for the Wooden Keels and Vintage Wheels on July 18. This was the third year that Knott has played for the show and he said that he always enjoys the gig. “This is a cool place just to come and hang out for a while,” he said. https://www.urbanacitizen.com/wp-content/uploads/sites/36/2015/07/web1_car.jpegThis ’52 Studebaker was among vintage vehicles during the weekend event. 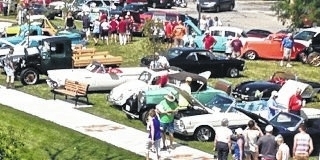 https://www.urbanacitizen.com/wp-content/uploads/sites/36/2015/07/web1_frombridge2.jpegThe 17th annual Wooden Keels and Vintage Wheels in Russells Point Harbor, as seen from atop the Sandy Beach Bridge July 18, had 90-degree temperatures, but that didn’t stop hundreds of visitors from viewing the beautifully-restored boats and cars. https://www.urbanacitizen.com/wp-content/uploads/sites/36/2015/07/web1_FullSizeRender2.jpgDiamond Girl is a marvelously crafted Marinacci Torpedo, the model name derived from the unusually-shaped stern. 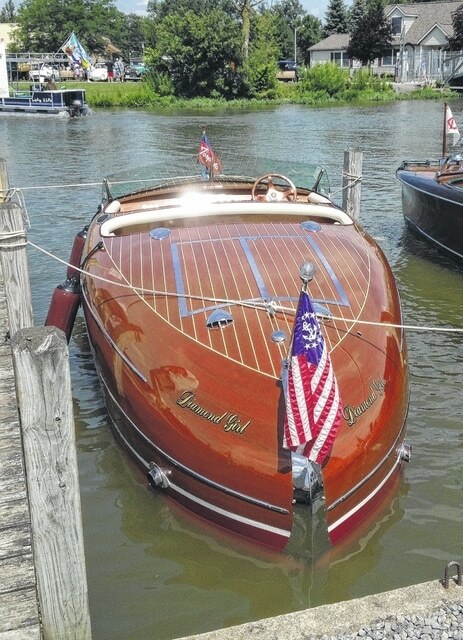 Owner Cliff of Zanesville said he named the boat Diamond Girl as a new rock was the exact price extracted from him by his wife once she learned he had bought the Torpedo to restore.